It sits quietly in the solemn autumn silence as the earth holds its breath before the blow of icy winter. Just off an I-75 exit in beautiful Eastern Tennessee, the building stands deserted, empty, its massive parking lot and landscaping now filled with dying weeds. A mute testimony to its past, a sign reading "VICTORY CHRISTIAN CENTER" is emblazoned across the side of the massive building facing the interstate. The day is sunny and bright, the skies an azure blue. But the frigid bite of the icy fall air is a reminder of the reality ..
A wheezing old Buick sedan clatters into view over a few hills and slowly lumbers into the parking lot, past the realtor's signs that advertise that the structure is on the market. It grinds squeaking into a halt by the huge faded white church marquis, still adorned with its lobotomized announcement - F R SAL. A white haired old woman, black scarf pulled down tightly around her face, gets out of the car, and gazes at the marquis, then the mute building itself, and the minutes pass. Dead leaves hiss lazily around her as the north wind kicks them up. Within her rheumy eyes the numbed anguish of a profound haunting bleeds from deeply sunken, wrinkled eyes. And then the tears start, and trickle down until her black gloved hands pull a handkerchief out and wipe them quickly away. A minute or two more, and she will - stifling a sob - get back into the Buick and drive off. The rusty, rattling old car will move out of the lot and down again over the hills, which it does once more, as it has weekly for two years. Disappearing, the weeping old woman leaves the silent building to the company of wheeling, cawing crows, seeking their daily bread. This was not the way that it once was. At one time, the church congregation that called this place home was open almost 24 hours a day, and laughter and joy spilled out into the streets. 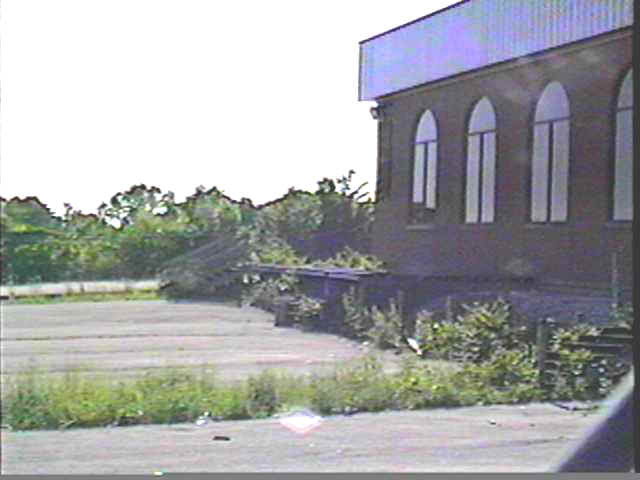 People would travel seventy miles one way to attend services, and if there was anywhere in East Tennessee where you could go to have church, this was the place. Lives were touched, transformed, and forever changed through the work that went on here. TV and radio beamed inspiration all over the Tri-State region, and the community embraced the church as its very own, gratefully acknowledging that some great things were accomplished here. That's the way it was, until ..
How did this happen? Thelma Swafford wrings her hands often as she asks this same question. And she is not alone. Thousands of others passing by ask this question as they drive past on the interstate. Dozens of other former members and community residents make their occasional pilgrimage of their own, stopping by the abandoned sanctuary to stare, mourn, and ponder all the unthinkable that they've beheld. For a couple of them, the weight of the answers were too much for them and their remains now rest quietly in the Mount Zion Cemetary just off North Lee Highway. Sadly, they will be joined by several others as the years pass. A few dozen struggle through torturous months of bleakness punctuated by therapy or numbing medication. For the most part, hundreds anonymously endure the excruciating agony without help, without much hope, and not a few marriages and lives crumble into a pit of alcoholism, domestic abuse, and atheistic bitterness. So what happened? How could so many lives be so disastrously turned aside? How did this church come to this terrible state of desolate extinction, to this mute state of ruin? This is the story of the birth, the death, and the life of the Victory Christian Center, the place that the power of love built but which the love of power destroyed.